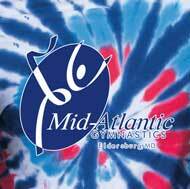 New tumbling class on Wednesdays, and Open Gym on Friday nights. A new cheer/tumbling class is available on Wednesday nights, from 7:45-8:45 pm. Open Gym is available on Friday nights, from 7:15-8:15. 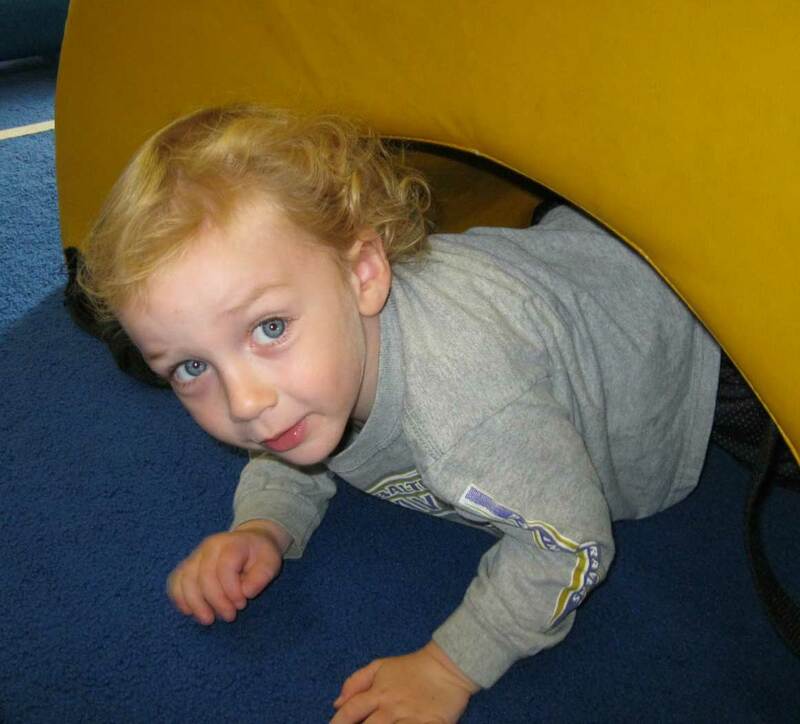 For other classes, days, and times, we are happy to accommodate any interest for a group of four or more. 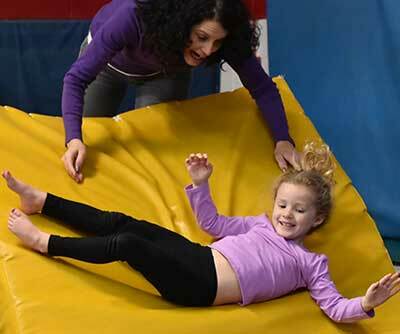 Children are natural gymnasts, swinging, rolling, and tumbling in everyday play. Not surprisingly, educators now recognize that gymnastics movement is fundamental to all physical activities. 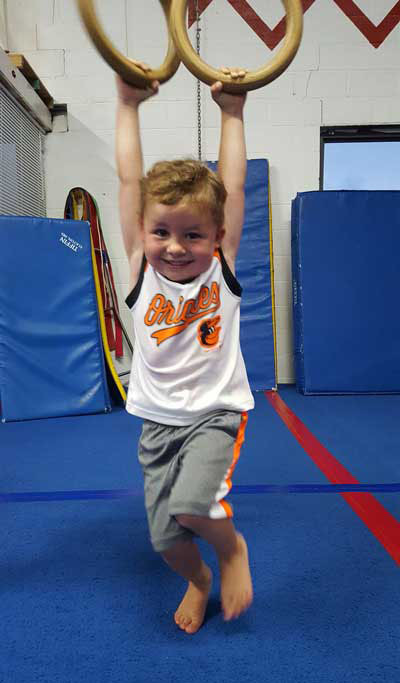 At Mid-Atlantic Gymnastics we keep the joy in the activities while refining the movement and technique. Our step-by-step progressions utilize both traditional and innovative approaches. This allows our safety-certified instructors to give your child the very best foundation for future physical and sports activities in a secure learning environment. Watch as your child builds self-confidence, physical awareness, and discipline in the fun-filled and safe programs at MAGC! 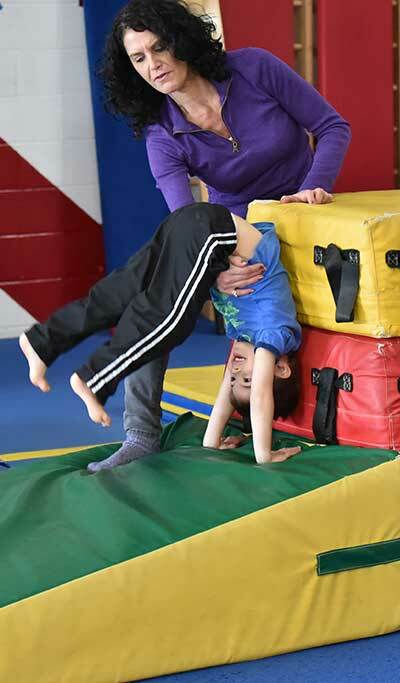 Teresa started at Mid-Atlantic Gymnastics Center (MAGC) at the age of five when she enrolled in the Tenderfoot class. Since her first day of class back in 1992, she has yet to leave the gym. Teresa progressed through her classes and became an instructor assistant to the original owners and founders, Richard Martin and Lynn Perrot, at the age of 12. She continued as an instructor through high school, college and even after she graduated from Towson University. During her time as an instructor, she has led and coached children of all ages ranging from 20 months to 16 years. In July of 2016, Teresa became the sole owner of MAGC following the retirement of the founder and long-time instructor, Richard Martin. At that time, the gym was to be closed and no future classes were to be held. MAGC had been in the Eldersburg community for 35 years, and Teresa did not want the families and children of her community to lose such an amazing place. 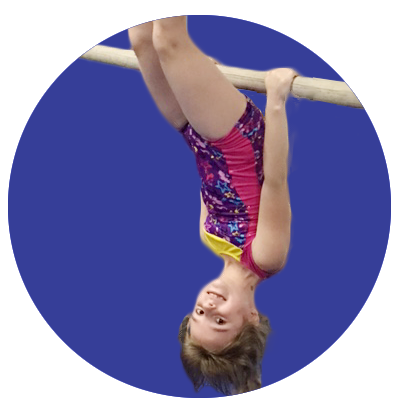 She is a strong believer in developing confidence, coordination and teamwork, through structured, yet recreational, gymnastics. 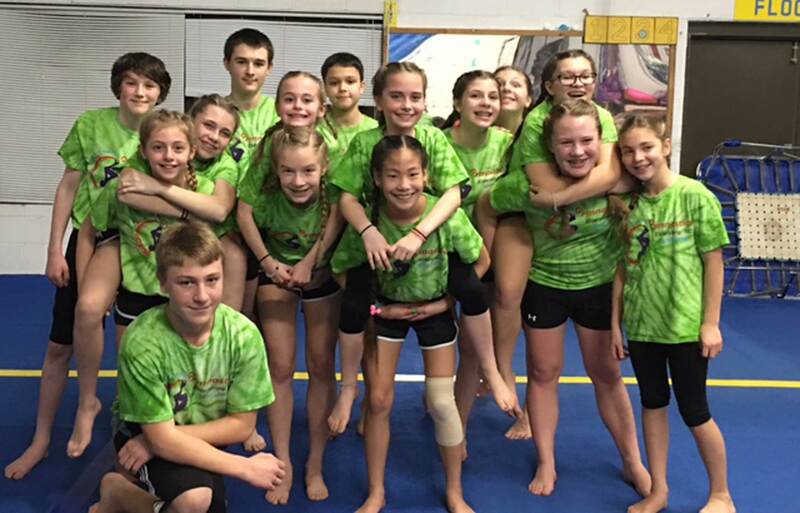 Teresa’s mission is to continue the legacy of the original founders and to keep MAGC a fun, exciting, and safe place to learn and to practice gymnastics. She is committed to hiring local teenagers to be members of her team. Teresa was born and raised in Eldersburg. She attended the neighboring Century High School where she participated on the track and field team. Teresa competed all four years at the state championships, won a first place state title in the long jump and shared several other state titles in her four year career with relay teams and triple jump. She later attended Towson University where she was a four year member of their Division 1 Track & Field team. At Towson, she majored in functional biology with a minor in chemistry. While attending Towson, she also completed her pre-dental program in hopes of pursuing a career in dentistry following graduation. After Towson, in continued pursuit of one of her passions (gymnastics is first of course! ), she completed the Registered Dental Hygienist License program at CCBC. In addition to her work at MAGC, she works as a dental hygienist at Dental Care located in the Eldersburg Commons shopping center. Through her professional pursuits, Teresa displays her passion for giving back to her community. At MAGC and through gymnastics, she is dedicated to helping children through developing overall well-being. Through her dental practice, she assists people of all ages develop healthier habits through dentistry. Richard Martin was the 1989-93 USGF State Director of Boys Gymnastics in Maryland. He was co-founder and co-artistic director of the Mu-sawwir Gymnastic Dance Ensemble, directing and performing with them for the athletes of the 1980 Winter Olympics in Lake Placid, NY and touring with the group throughout the US and Switzerland. Richard has three times been a guest instructor at the United States Olympic Training Center in Colorado Springs, CO. and has been involved with the Mid-Atlantic Gymnas-tics Center, providing excellent gymnastics train-ing for Maryland area students since 1981. Lynn Perrott was a nationally rated gymnastics judge through the Brevet level. Lynn joined the Musawwir Gymnastic Dance Ensemble in 1974 and later became co-artistic director in 1979. Our program is open to boys and girls at all levels of gymnastic experience, beginner to advanced, with a desire to learn gymnastics. At M.A.G.C. we have created an atmosphere both challenging and enjoyable, designed to develop all students’ physical and mental abilities to the fullest, while instilling positive life-long attitudes toward every aspect of themselves. A lively introduction to the world of movement with parent/guardian participation. 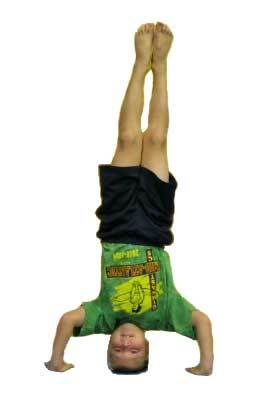 Teaches basic gymnastic techniques and movement necessary to any future physical activity. A playful yet well-designed class for pre-schoolers to develop coordination and concentration at a time that is so important for long-term sports development. A confidence building experience which explores basic movements on all apparatus by creating simple gymnastic combinations and routines. Tailored to the individual student’s needs, with emphasis on learning and fun. Classes grouped by age and ability. The purpose of this class is to move fluidly through a series of obstacles with power, agility and grace. 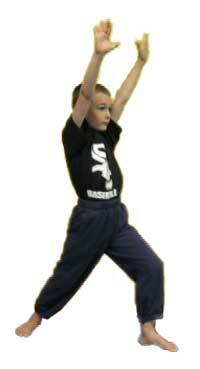 The young ninjas will learn techniques to vault, roll, jump, spin and flip in a fun and exciting form of exercise. 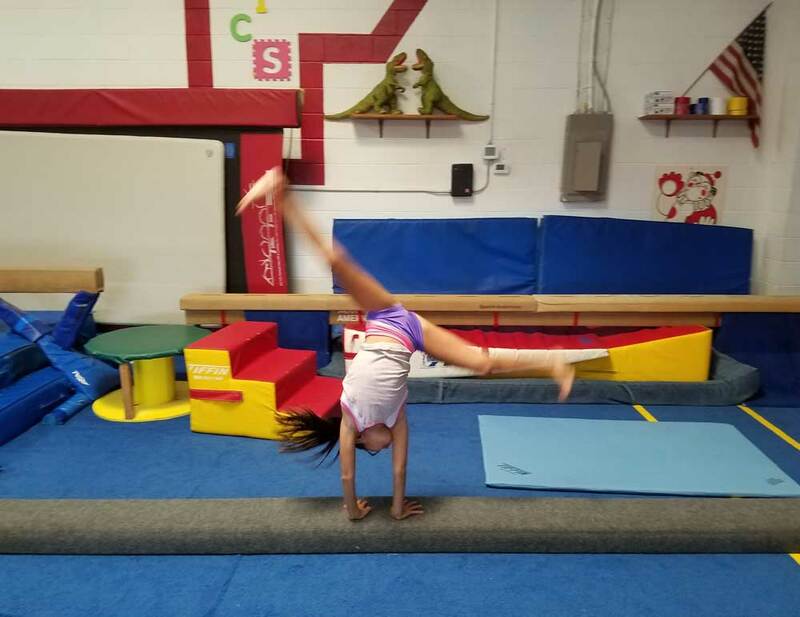 Utilizing our safety mats and our gymnastics equipment as obstacles, the young ninja’s movement abilities will grow through safe, fun and exciting challenges. Private lessons are for any age/level looking to achieve a goal. The lesson can be for one-on-one instruction, a pair or a even a whole group. They are a great way to introduce gymnastics through building motor skills, perfect a desired skill or learn a new challenge. 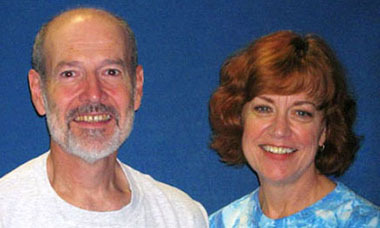 They are scheduled outside of regular class times with any preferred instructor. 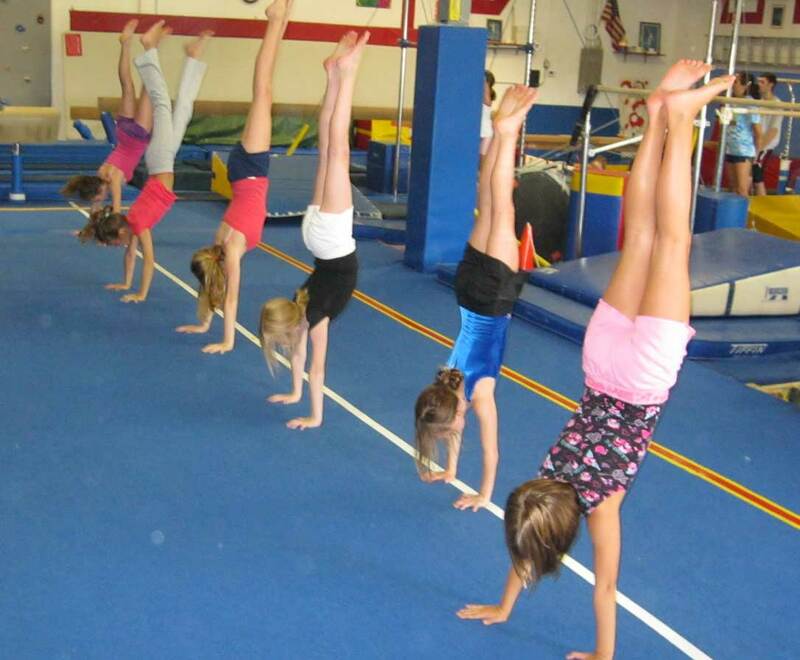 A morning of gymnastics fun, including bars, trampoline, trapeze, rings, beam, tumbling, and more! 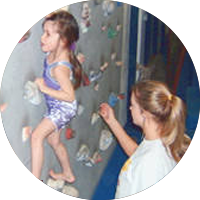 Extra activities include gymnastic games, videos, and arts & crafts. 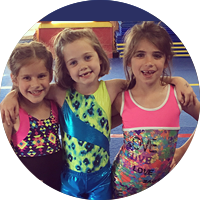 A four hour day program for children entering first grade and up (all levels of gymnastic experience, beginner to advanced, with a desire to learn gymnastics)! Discounts will be given for more than one child in the same family and for multiple weeks. 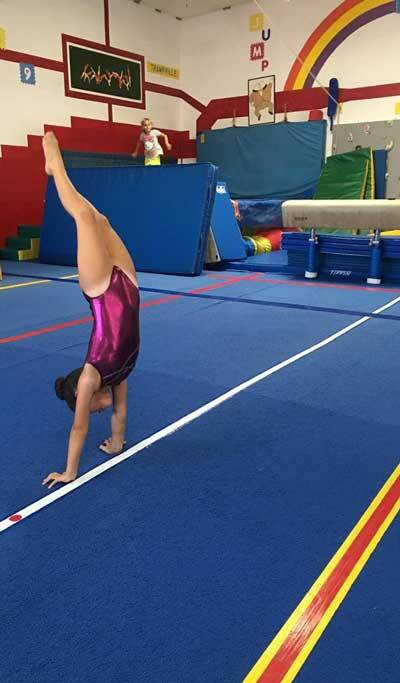 Traveling a lot this summer, but still interested in having your child do gymnastics? Take advantage of our summer special! Just let us know ahead of time which classes you will be missing during the summer session, and pay only for those classes you will attend. It’s a special program and only available for summer! Yes, they are one of the best parties around – ask anyone who’s been to one. About 45 minutes of activity in the gym is followed by about 45 minutes in the waiting area for your party. Parties are scheduled for Saturday and Sunday afternoons, and if you are looking for a specific date, we suggest you schedule about two months in advance. All parties must be booked through M.A.G.C. The registration fee is charged annually covering the entire school year (September - June). 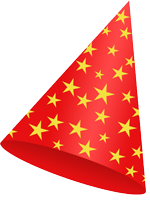 There is no registration fee for Summer (July/August) Sessions. Session Fees vary depending on the length of the class and the number of students allowed per teacher. See the table for the rates. There is a 10% discount on registration and session fees for all children in the same immediate family. Make-Up classes are offered only during the enrollment of the child, and only if there is a space available in another class of the same level. If you know your child(ren) will be missing a class you may schedule the make-up prior to the absence. We regret the possibility that there may be a time we cannot offer a make-up due to the lack of space in our program. A missed makeup class may not be rescheduled. No credits or refunds for missed classes. Unless there is an injury (doctor's note required) or unforeseen circumstance approved by owner. Conflicts with schedules or other activities are not eligible for credits or refunds; make up classes ONLY! MAGC must be notified for any missed classes within 24 hours. If not notified, the above policy for credits or makeup is exempt. Any credits given must be used within same year. *The Earlybird Special is for those who pay by week six for the next session. Pay for just the classes you will be attending! All private students must have a registration form filled out, for the current year. No registration fee is required. Private lesson students are only allowed in the gym during the lesson. Any time in the gym counts as part of the allotted time for their lesson.